The Reverend John A. Cradle, Sr. was born September 16th, 1958 to Vivian L. Farrar of Durham, NC and the late John Henry Williams; he is the oldest of (5) children. Reverend Cradle currently reside in Durham, NC with his wife of (24) years Lynette D. Cradle. They are blessed within their marriage to have two children, Jasmine (24) and John II (22). On February 24th of 2014 God extended the blessing of their 1st grandchild, Tru Jhai (pronounced Jay) Ridick. Reverend Cradle was ordained Deacon by the late Senior Bishop of the Christian Methodist Episcopal Church, Thomas Lanier Hoyt Jr. on July 22nd, 2010 at 138th Session of the Carolina Region Annual Conference and two years later as a Traveling Elder by the same, Senior Bishop at the 140th Session of the Carolina Region Annual Conference in Greensboro, NC. 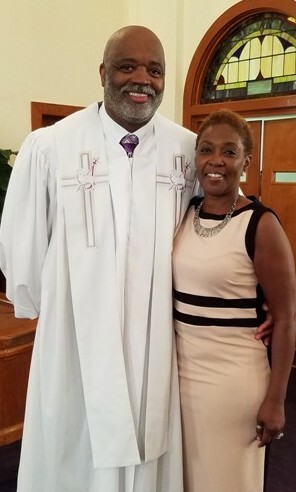 During his journey, Reverend Cradle has served five years as the Associate Pastor of Faucette Memorial CME Church in Durham, NC (Pastor Julian Couch), and presently as the Associate Pastor of the great Russell Memorial CME Church, Durham, NC (Pastor Dr. Wayne Williams). Reverend Cradle is employed by Chatham County Department of Social Services as a Social Worker in Adult Services. He is a Case Manager for Special Assistance In-Home clients. He is responsible in assisting and ensuring that senior citizens can safely remain in their homes. Reverend Cradle considers this to be Geriatric Ministry offering a window of opportunity to be a witness of an ever present God that promises never to leave nor forsake us.